Kabal Shah sits in his barbershop in Kabul, holding a pucture of his brother Adel who was killed by in a Taliban-claimed suicide bombing. Photo by Ezzatullah Mehrdad, used with permission. 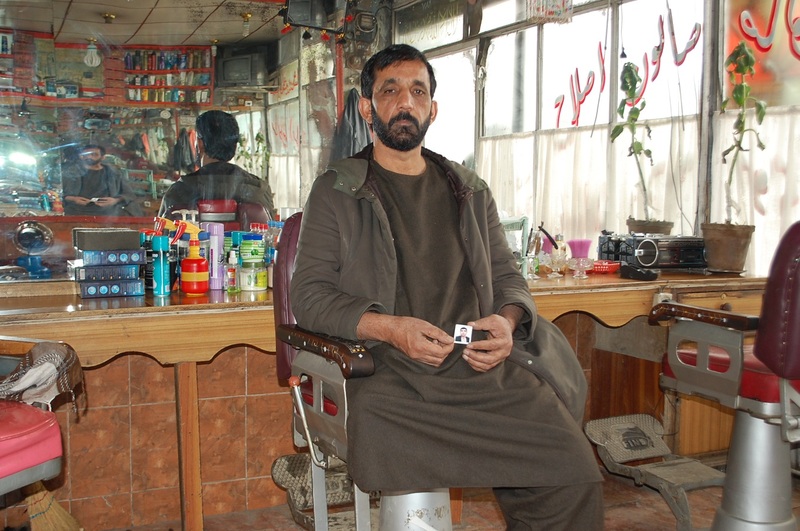 Kabal Shah, 52, watches the news on the peace talks between the U.S. and the Taliban group in his barbershop. Every time the news anchor reports on development in peace talks, Kabal Shah recalls the memory of his brother, Adel Shah. One day in 2017, Adel was on the way to his barbershop when Kabal heard a huge explosion. He called Adel several times until a doctor at Wazir Akhbar Khan Hospital picked up the phone. The doctor pronounced his brother dead. “We are powerless” to seek justice, says Kabal Shah who lost his leg during the civil war of the 90s. 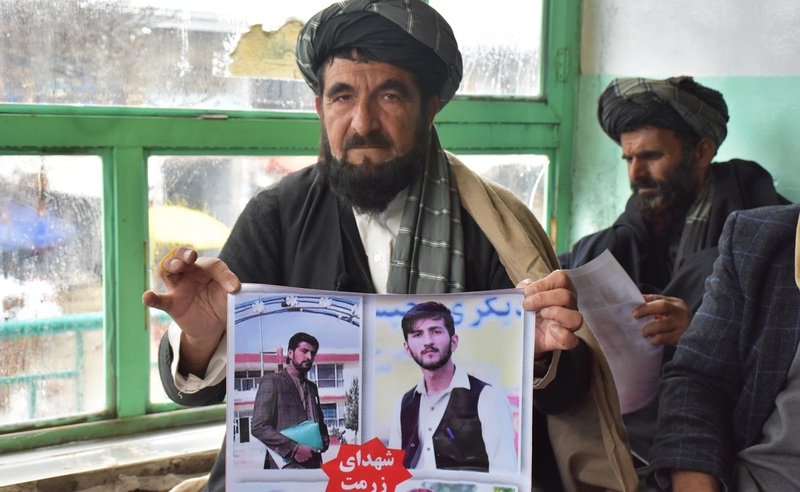 “There are thousands of us that nobody sees.” Kabal says that when a Taliban suicide bomber targeted a convoy of U.S. soldiers, the attack claimed the life of his 24-year-old brother. But he hopes that the same does not happen to other young Afghans like Adel. U.S. envoys and representatives of the Taliban are attempting to negotiate a way out of the war they’ve been fighting for 17 years, during which thousands of Afghan civilians have been killed and wounded. But in these peace talks, the names of civilian victims are seldom heard. About 31,000 civilians have died from 2001 to 2016, according to the Watson Institute of Brown University. An additional 41,000 civilians have been wounded. Crossfire, improvised explosive devices, assassinations, bombings, nighttime raids on homes of suspected insurgents, and airstrikes have been blamed for the high civilian casualty numbers. According to the UN Assistance Mission in Afghanistan, 5,272 civilians were killed and injured in 2017 alone. Still more were killed and injured in 2018, the deadliest year of the war, according to the UN report: 10,993 civilian casualties, including a record number of children. UN reports attribute at least 63 percent of civilian casualties in 2018 to various insurgent groups, including the Taliban and the Islamic State. The blame for 24 percent of civilian casualties falls on Afghan and American militaries. As an example, Tassal tells the story of an 18-year-old girl, the lone survivor of an airstrike in Nangarhar province which killed her entire family. Before the airstrike, the girl had been engaged. But after the tragedy, the family of her fiancé refused to accept the disabled bride who had lost an eye in the explosion. Now she lives with her uncle who demands that she pays him back for what he’s spent on her sustenance. The Taliban-claimed suicide bombing in Kabul on July 24, 2017, killed at least 38 people, including Najiba Bahar Hussaini, an employee of the Ministry of Mines and Petroleum. Her and Husain Rezai were engaged and planned to marry after two years of romantic relationship. “Peace does not matter to me, personally,” says Rezai. “I just don’t want to see any more people suffer and lose their loved ones.” He says he hoped that the International Criminal Court would persecute the Taliban for murdering civilians, but now he’s all but abandoned his hope. Latifa Sultani, a liaison for Afghanistan’s Independent Human Rights Commission (AIHRC), says that the victims demand an unconditional end to the war, not a peace deal which would grant impunity to the perpetrators. AIHRC has frequently called for including the representatives of civilian victims in the peace talks, as there is a tangible danger of them seeking violent revenge after failing to bring their attackers to conventional justice. But for some relatives of the victims, only an answer for their losses would calm them down. Ghulam Mohammad, in his 50s, was listening to a radio news broadcast on December 31 last year, when a group of armed men stormed his brother’s house. Ghulam Mohammad rushed to his brother’s house. He found his brother, Naim Faruqi, and his two sons killed by shots in the face. Ghulam’s nephews were students at local universities. Then, a group of armed men lined up Ghulam Mohammad’s family on the balcony of his own house. One of the armed men came forward and told Ghulam Mohammad that they would spare his and his family’s lives. Recently, CIA-sponsored Khost Protection Forces carried out night raids in the region. Allegedly, it was the KPF that raided Ghulam Mohammad and his brother’s houses. Ghulam Mohammad reached out to the local governments in Zurmat District and Paktia Province, but they refused to supply any information about the operation and those who had raided his brothers’ house. Ghulam Mohammad holds a picture of his nephews who were killed by a night raid in their houses in the eastern region of Afghanistan. Photo by Mohammad Imran.